« THAT’S ANOTHER FINE ‘MESH’! 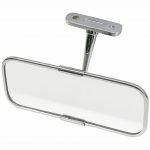 Burton Power can now offer a direct replacement for the original Cortina Mk1 and Mk2 interior mirror. Unlike the plastic original, the Burton version is manufactured from stainless steel. This mirror is also suitable as a universal fitting mirror for various applications including kitcars. It can be fitted as intended, hanging down from the ‘screen frame, but can also be fitted to the top of the dashboard standing upright. The mirror includes a two-screw fitting with 42mm hole centres with the mirror dimensions 155mm x 63mm with an overall height of 90mm. Available as part number MIRRORC12RV with a retail price of £19.40 inc VAT. More details from Burton Power on 0208 554 2281 or www.burtonpower.com ENDS. Print article This entry was posted by admin on November 2, 2018 at 10:43 am, and is filed under News. Follow any responses to this post through RSS 2.0. Both comments and pings are currently closed.